Eastwood’s Top Selling Bass gets BIGGER! 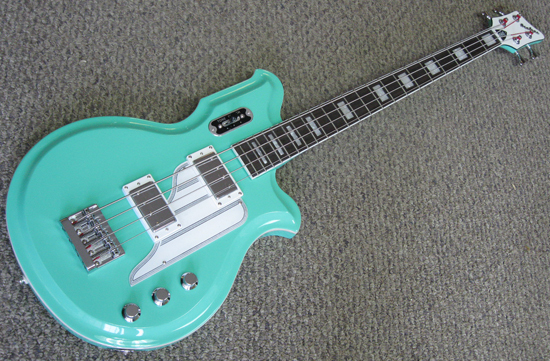 The NEW 34″ scale Airline Map Bass in Seafoam Green! 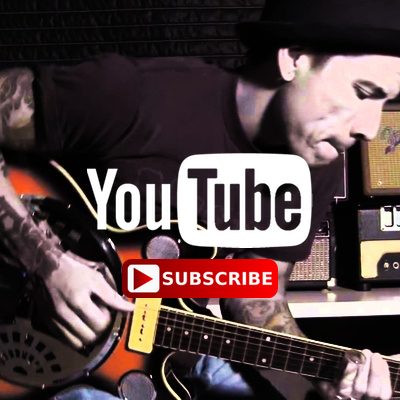 Stephan Wickham: Eastwood Guitars basses and guitars are real sleepers for most people. 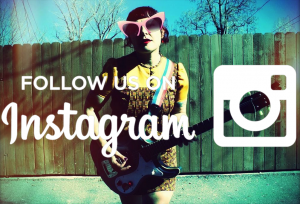 It will surprise many that they have large acceptance with musicians in alternative genres such as West Coast Punk, grunge and modern alternative rock. Eastwoods are popular with some top players like John Fogerty, Mick Karn and groups like Foo Fighters. People expect the build quality of original Danelectro (e.g. particleboard bodies) and Valco / National guitars / basses and are surprised to see Eastwood Guitar reproductions that there are improvements, such as the body tonewood. While the Airline MAP bass carries Airline name it is actually based on Valco 1962 Val-Pro 85 bass. It produces a killer low rider tone and works best with a medium-to- fast player. In addition to punk, grunge it fits well with 60s rock, Grateful-Dead tone, reggae, modern country & blues. The body is chambered mahogany, rather than acrylic resin / fibreglass of original Val-Pro 85. I would swap out the bridge, nut and knobs to better quality components and it would be good to go. For people that don’t like the Sea-Foam Green, it also is available in White or Black. In Black it comes with black & white pick guard with white binding on body, which gives it a bit of art-deco Duesenberg design flavour. The addition of a 34″ scale to the Eastwood Airline MAP bass product line offers an excellent tone alternative to original 30″ short-scale model and more familiar length for most bassists. ← New Sidejack Bass VI from Eastwood Guitars! What does “a “Bass Players” version” mean? If you’re trying to say that bassists who play short-scale basses aren’t “bass players”, I find that offensive. It sure looks like it’s not a “Tune-o-matic bridge, trapeze tail” to me. I agree that guitarists tend to prefer short neck basses–at least *I* find them more comfortable–and most bass players do like the long-scale necks. Like anything, it is a matter of preference, and I am sure no insult was intended. I also caught the quotations around “Bass Players”. 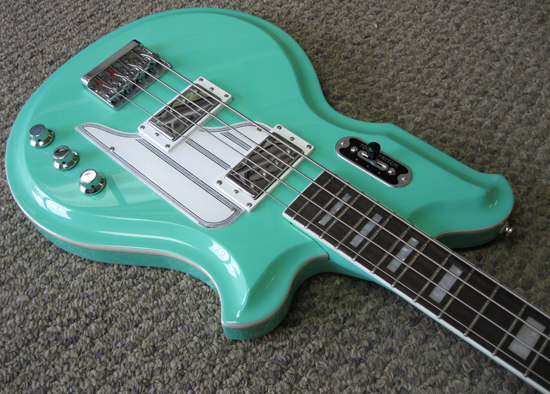 That aside, the MAP guitars have always been amazing guitars, particularly in that seafoam green color. The long scale also makes the instrument look less “guitar” and more “bass” from a distance. I like the new bridge, too. 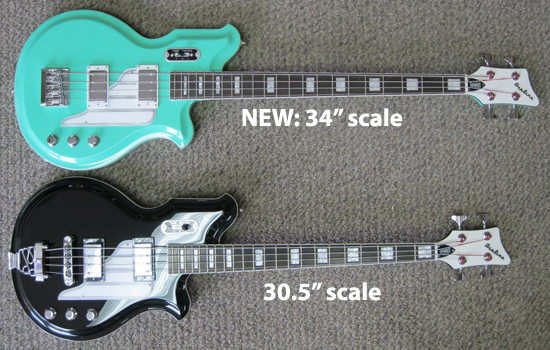 Does the new Map Bass come in White or just seafoam green? I want one badly, but I want one in White. Is there ANY chance of Eastwood making this bass in white? Any chance at all? if the 34″ scale starts to outsell the 30″ scale, then yes. However, that is unlikely to happen, and certainly not for a couple of years. 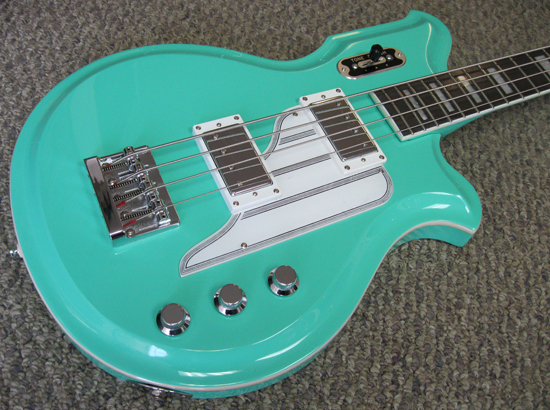 Where can I get a 34 inch neck….seafoam? Will a seafoam map 34 inch bass be available anytime soon??????????? ?